Travel to Bologna, Italy and you'll find as many recipes for this classic Italian pasta sauce as there are people. Whatever the variations, it's generally always a mixture of ground beef and pork, slowly simmered in a tomato-based sauce until the flavors blend together in a complex ragu that's greater than the sum of its parts. In this recipe, beef, pork and pancetta are cooked with a mirepoix of onions, celery and carrots, seasoned with basil and oregano, and simmered with tomato sauce, white wine and chicken stock. Prepare this special pasta dish for date night or a winter dinner party—it's the ultimate comfort food. 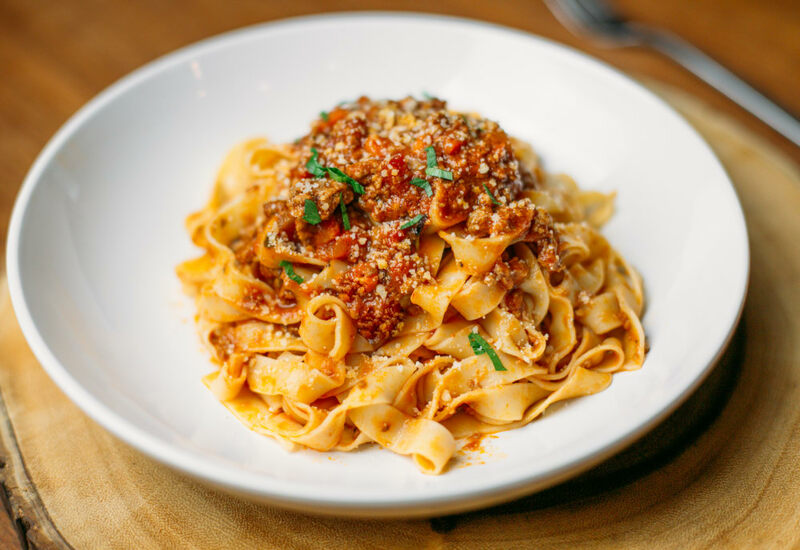 Bolognese ragu freezes well for up to three months. Double the batch of sauce and freeze half of it for future dinners and easy entertaining. For a decadent, more authentic experience, buy fresh fettucine from your local gourmet market or pasta shop. Per Serving: 488 calories; 24g fat; 35.4g carbohydrates; 28g protein; 79mg cholesterol; 228mg sodium. Tried this bolognese recipe and loved it. The white wine, chicken stock, and basil gave it great flavor. Perfect, classic meat sauce that is hearty and delicious. Can't wait to make this again. I tried this recipe and it was so yummy. This is probably one of my favorite bolognese recipes! If you're looking for a classic hearty meat sauce with traditional flavor, this is it.